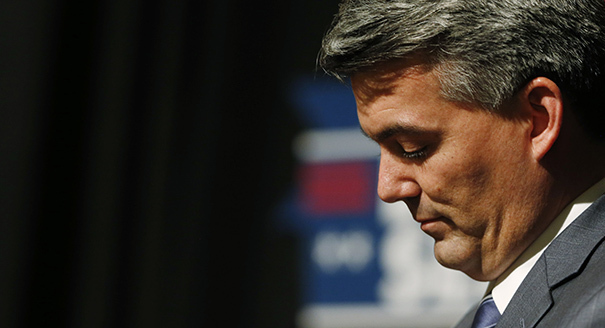 U.S. Sen. Cory Gardner (R-CO) has been taking it pretty hard from all Coloradans, judging from his low approval ratings, and his conservative base isn’t giving him a pass when it comes to criticism either. 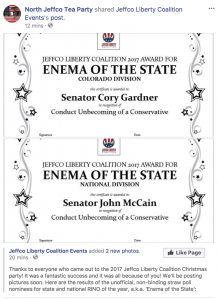 In one recent Facebook post, for example, the North Jeffco Tea Party shared an image of an “Enema of the State” award that was apparently bestowed on Gardner by a vote at the Christmas Party of the Jeffco Liberty Coalition. 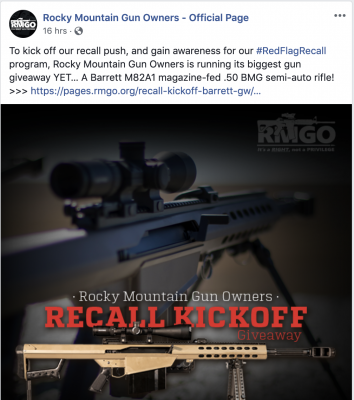 Gardner has also been under serious attack most of the year by some conservative talk radio hosts here in Colorado, most recently because of his abandonment (and then partial embrace) of failed Alabama Republican Roy Moore, but generally because of his close ties to U.S. Senate President Mitch McConnell of Kentucky, who’s seen as a tool for moneyed GOP interests–as opposed to a champion of Tea Party principles. Gardner won’t support Republicans who “are voting based on what the voters want” because “that threatens [his] entire existence,” said Hayden, who’s a former Fox 31 Denver reporter. Gardner did not immediately return a call for comment, but defended his opposition to Moore by saying he was “unfit” to serve in the Senate. Gardner holds a leadership role in the U.S. Senate, working closely with McConnell, and Gardner has been a reliable backer Senate leader all year. 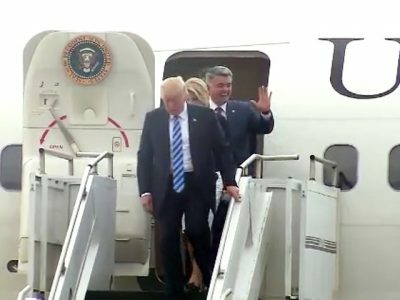 Gardner has also voted with Trump 94 percent of the time. 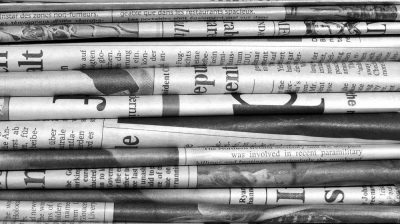 “If anybody is a weasel, Cory Gardner is a weasel,” said Bonniwell said earlier this month. Not all on talk radio are critical of Gardner. Conservative KNUS host Dan Caplis is unwavering in his defense of Gardner, asking his Tea Party critics to name a single vote that Gardner has gone the wrong way on.